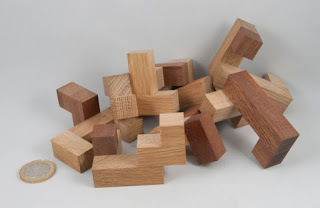 At the last MPP get together, fellow blogger Kevin followed through on his threat to bring a bunch of his latest acquisitions from Bernhard Schweitzer down for us to play with. He’d been taking quite a lot of things off Bernhard’s hands recently and as luck would have it had ended up with one or two duplicates ... including a copy of Double Lock made by the good folks at Pelikan, and he was kind enough to let me take it off his hands for a jolly reasonable price, so I did. Pelikan’s proud standards have been properly upheld on this handsome cube made from oak with a pair of mahogany(?) accents on each face ... and those accents provide a clue to the name as well as the mechanism. Double Lock is delightfully named as you will discover when you begin to play with it... you can spend a while prodding and tugging various bits in order to find the first move, and when you do, you’ll find that the locking piece is actually a locking pair of pieces that need to be manipulated in order to get them free ... leaving you with an interlocking shell made up of a further five pieces – making it a really interesting little 4*4*4 cube. 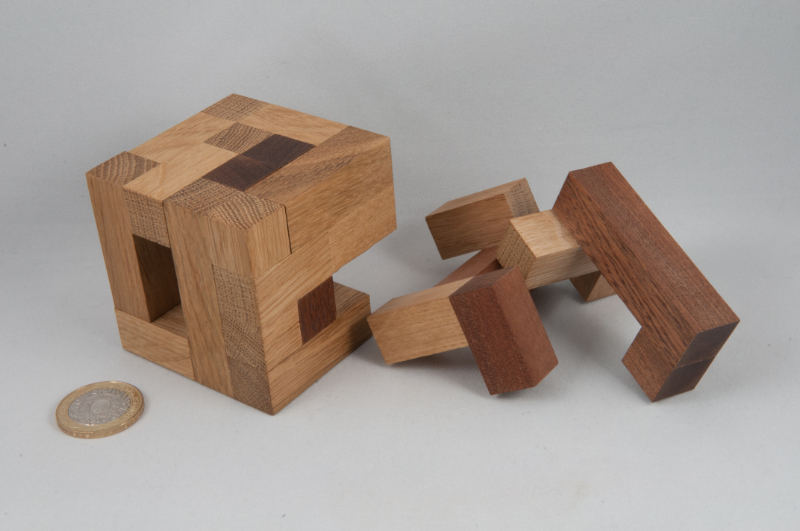 Assembly presents a pretty decent challenge to any puzzler ... even if you’re expecting the final Double Lock. Thanks Kevin for introducing me to the Double Lock and for letting me add it to my collection! 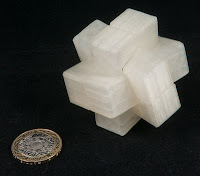 I mentioned in my write up on Peter’s EPP that Steve Nicholls had been demonstrating his 3D printer during the course of the afternoon and that he’d given me one of his wonky burrs... a couple of weeks ago at MPP, Steve had piles of newly printed goodness and I snagged a couple of interesting little puzzles. 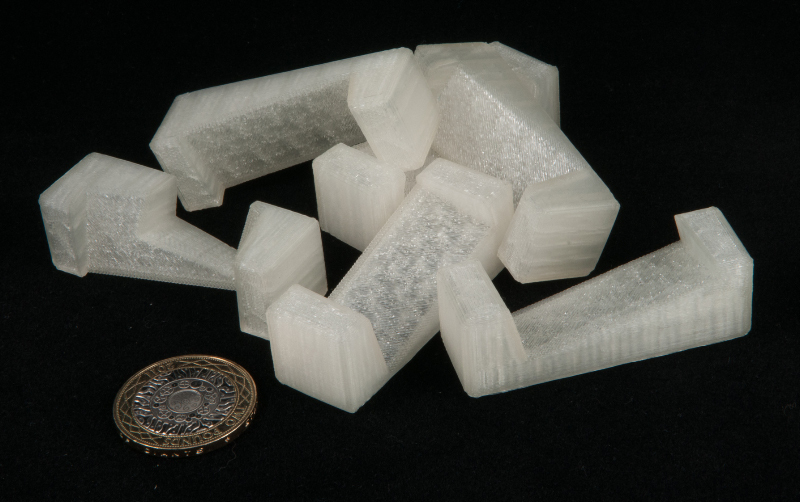 So today’s post is brought to you compliments of Steve’s Makerbot! 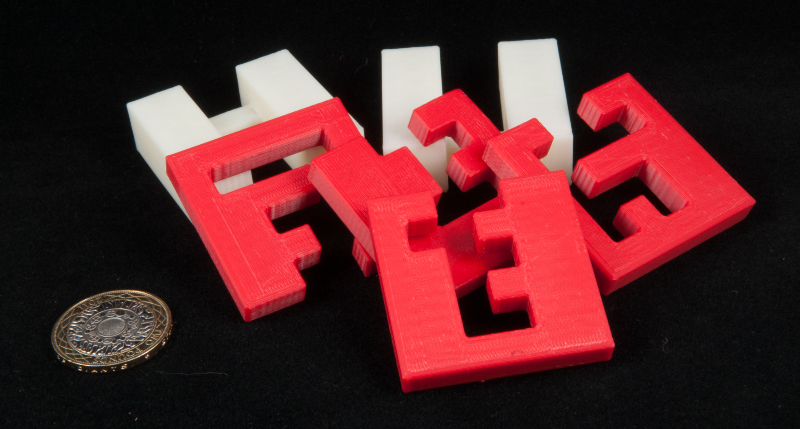 If you’re at all interested in 3D home printing, you’ll have heard of Makerbots – they’re on the instant gratification end of the scale when it comes to 3D home printers – that doesn’t mean you can’t tweak them and improve them, but they do come pretty much ready for action straight out of the box, unlike some other 3D printers that require a steady hand, a soldering iron and plenty of time on your hands... but I digress. 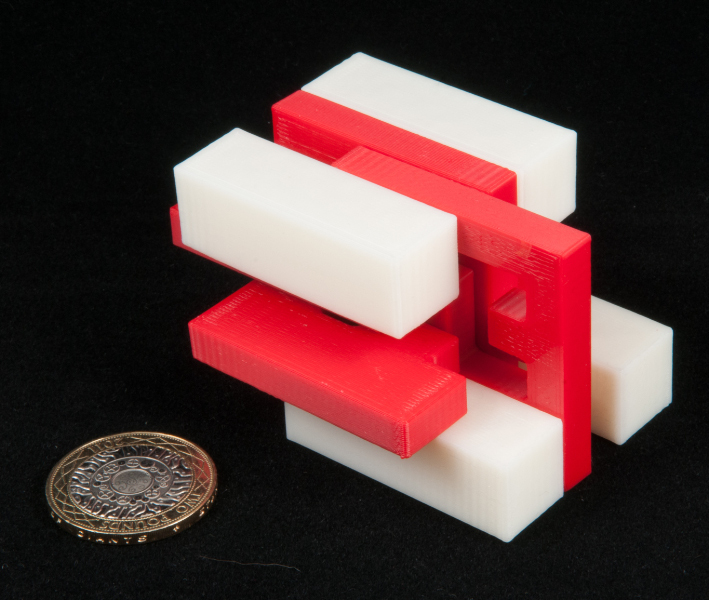 The software takes care of all the internal structure on the basis of how ‘full’ you want the insides – basically it makes sure there’s enough material to keep things rigid by building up internal walls between the surfaces – clever that! 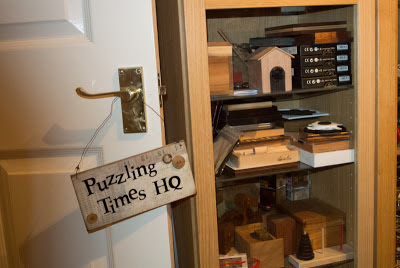 The surfaces on my puzzles have a slightly bumpy feel to them, presumably an artefact of the way the plastic is printed in lines –this doesn’t detract at all and in fact, on the wonky burr, it actually helps to hold the pieces with a little extra friction. 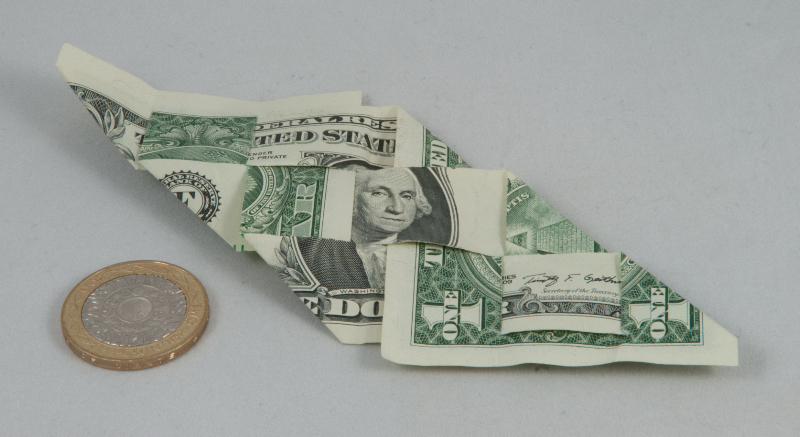 I’ve already talked about the fact that the wonky burr is quite disorientating given the odd angles – and it kept a couple of the guys busy for quite a while at MPP ... that says a lot, methinks. At MPP9 I picked up a copy of Donald Osselaer’s CubeBurr and Stewart Coffin’s Peanut, fresh off the Replicator. 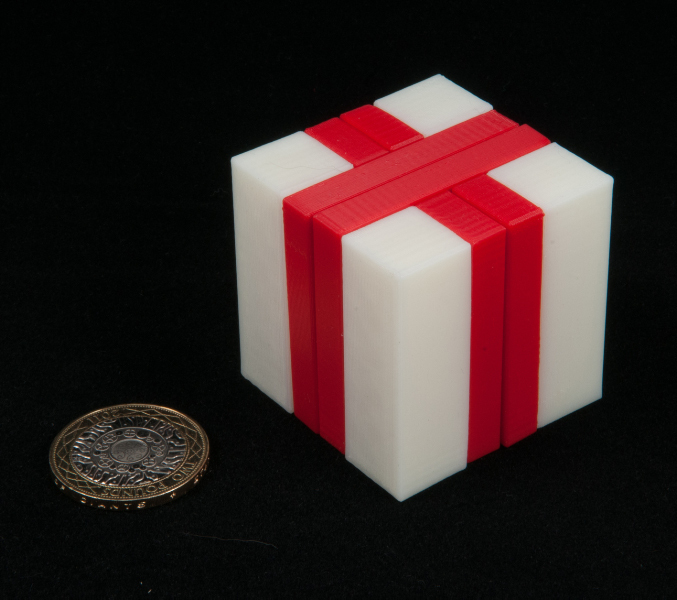 Steve’s made the CubeBurr in red and white and they look rather English from the right angle. CubeBurr is made up of four (red) boards on the inside and a pair of fat (white) ‘H’s on the outsides making up a cube when fully assembled. It’s a non-trivial burr, requiring 13 moves to free the first piece, and another 5 to remove the second... so even disassembly is “interesting”. 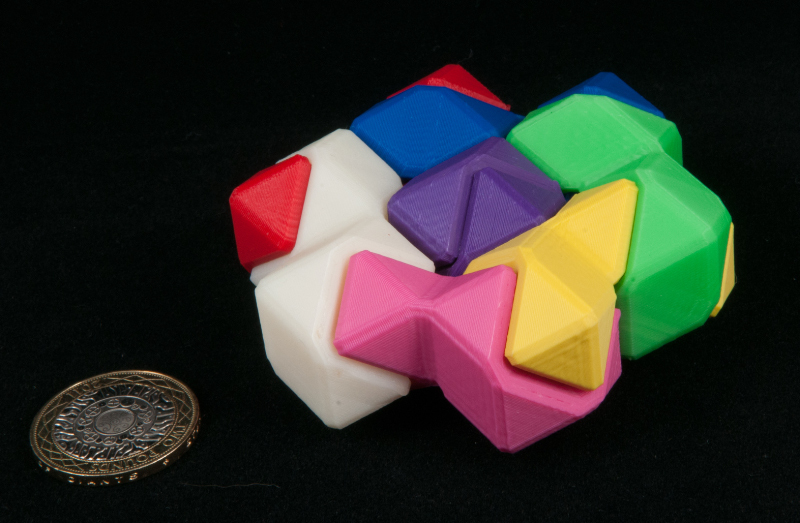 Steve’s printed off a set of the pieces (together with a pair of half rhombic dodecahedrons to go in the centre of the hexagonal ring) in what can only be described as pretty psychedelic colours! I think they look excellent... sure I’d love to have a beautifully crafted Peanut in exotic hardwood, however this one’s fun to play with, won’t get damaged by passing kids (or dogs!) and really stands out on the puzzle shelf! 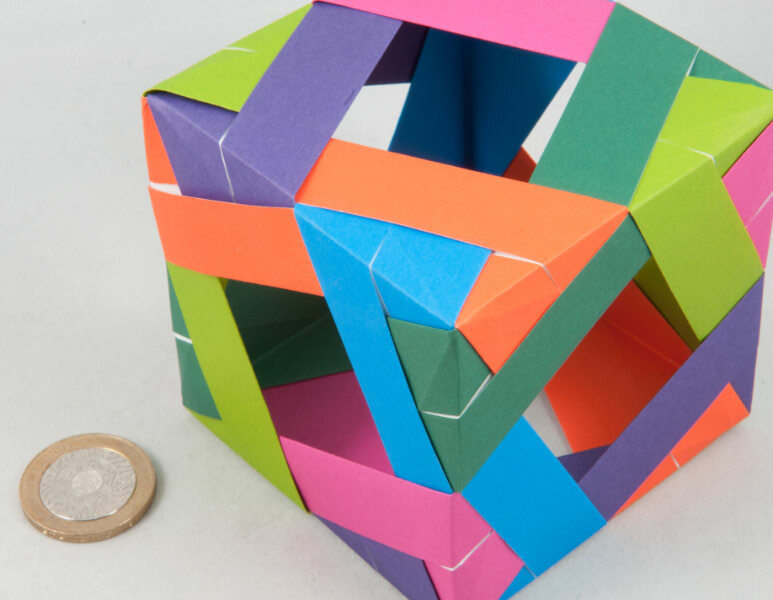 Next up is an excursion into the world of modular origami. I’d spotted the odd picture of some of the incredibly impressive creations out there in internet-land and thought they might be fun to have a bash at so I ordered a book or two (I know there are lots of resources on the internet – I just like books!) 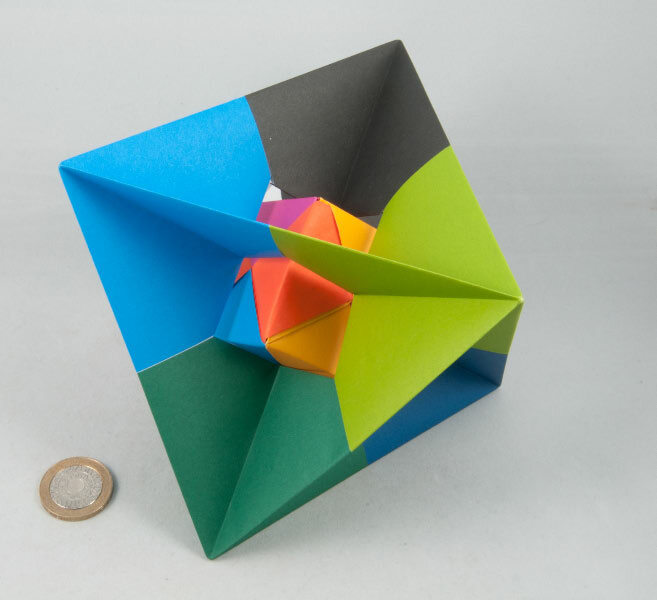 and a couple of piles of nicely coloured paper squares – and then spent a few afternoons merrily folding and piecing things together until I had a small collection of interesting-looking assemblies in bright colours. There are some mighty creative people out there and it’s quite amazing what can be made from a few variations of a fairly simple base unit ... one of the books I picked up details a bunch of different base units and explains how to create them with various angles which you can then use to piece together your own creations ... the other thing that fascinated me was the way using similar base units pieced together in different ways produced totally different constructions. 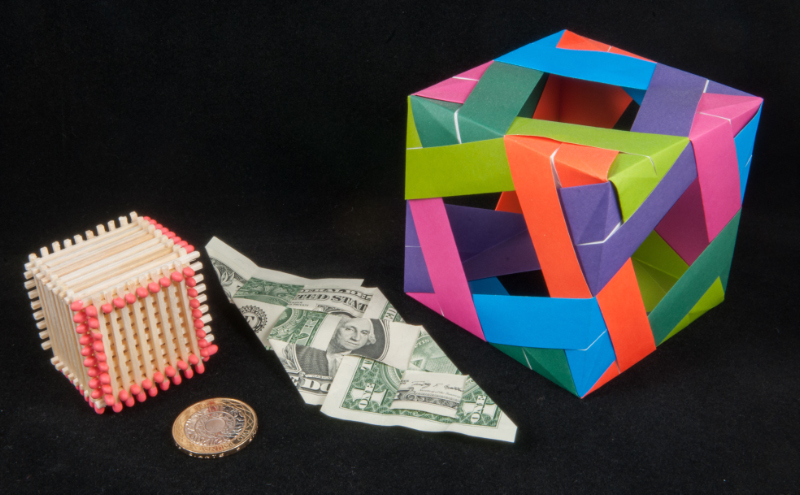 Since a couple of folks have asked, the two books I picked up from Amazon for myself were: Beginner's Book of Modular Origami Polyhedra and Marvelous Modular Origami. There are plenty of other titles out there and some awesome websites that teach you how to make them as well... Google is your friend! 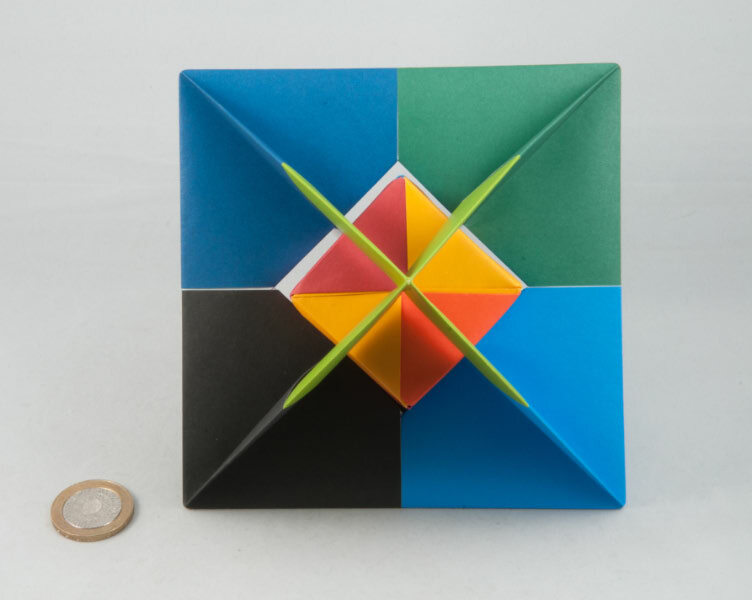 Unfortunately the first few attempts were all miserable failures ... despite following the instructions to the letter, making sure everything was nice and square and tight, I’d get toward the end only to have my cube-in-waiting disintegrate in my grubby paws... so I tried harder. I tried different methods. I tried my own methods ... and never managed to end up with a self-supporting cube... so I did the obvious thing and blamed my materials! 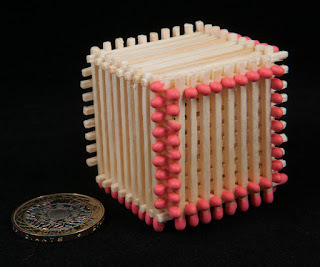 Up to then I’d been using what I assumed were standard sized matches and I’d assumed they were all pretty much a standard quality... but unwilling to admit I might just be too ham-fisted to actually construct one of these cubes, I went out and bought some slightly larger matches ... in a different flavour. And these ones looked far more promising from the get-go ... sure they were a bit longer, so they would need a bit more work to complete, but this time they seemed to form a far more secure base than the shorter ones ever had ... and on my second attempt with them I had a cube that was pretty much complete and showing all the signs of gripping together properly ... success! 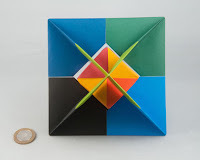 I picked up an interesting little puzzle called Tantrix Match Mini from Tomas Linden in Washington last year. 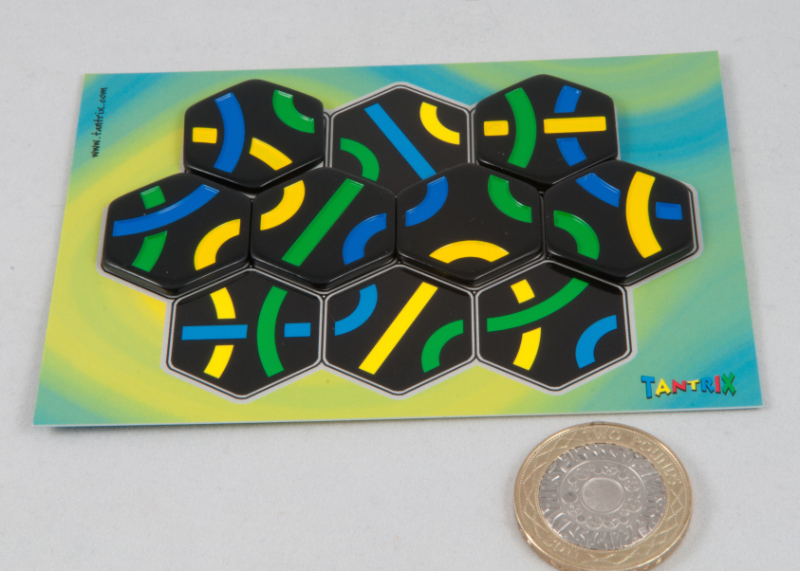 From memory it only cost about a fiver and came with ten graded puzzles printed on some nice shiny card and six mini Tantrix pieces. 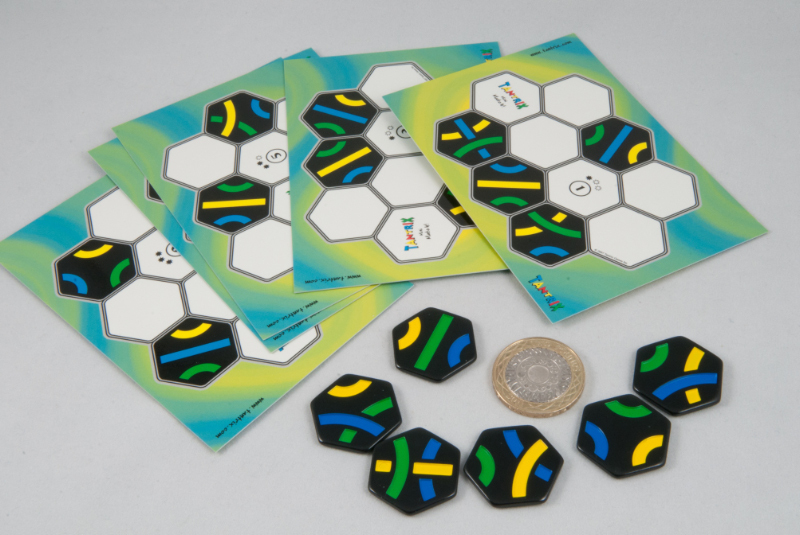 Each of the puzzles has a grid of ten hexagons, four of which are pre-printed – your job is then to place the six tiles in the blank squares so that the edges all match. 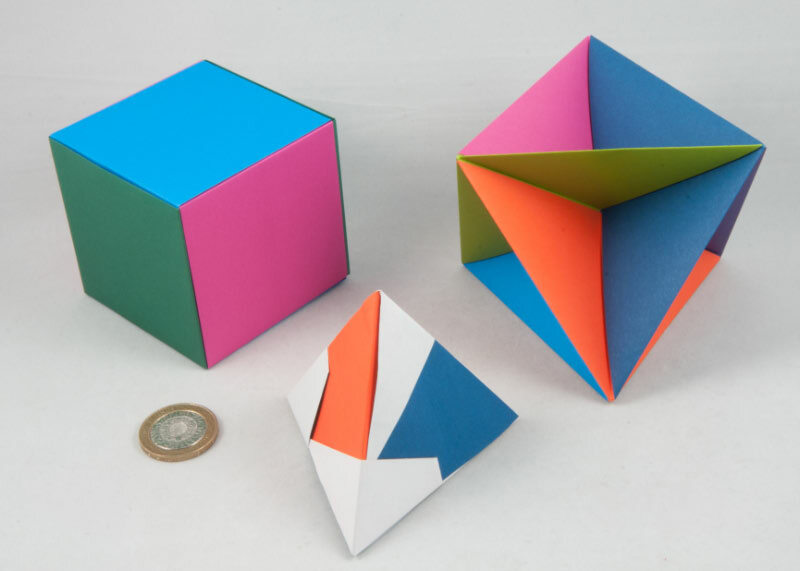 They start out pretty simple and then ratchet up until the last couple present a fairly decent challenge. 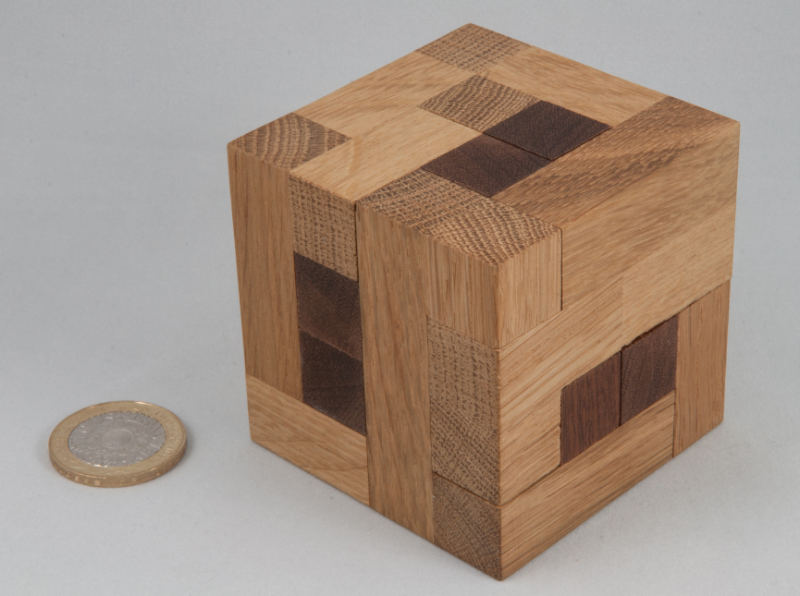 I really enjoyed this little puzzle and thought that it presented a great puzzle per pound (in both senses!) balance. After I’d made my way through those ten challenges I did some Googling to see if there were any other similar puzzles out there and managed to find its bigger brother, Tantrix Match... and a little while later one arrived at my front door courtesy of Amazon. Whereas Mini majors on puzzle and minors on presentation, bigger brother almost does the reverse. 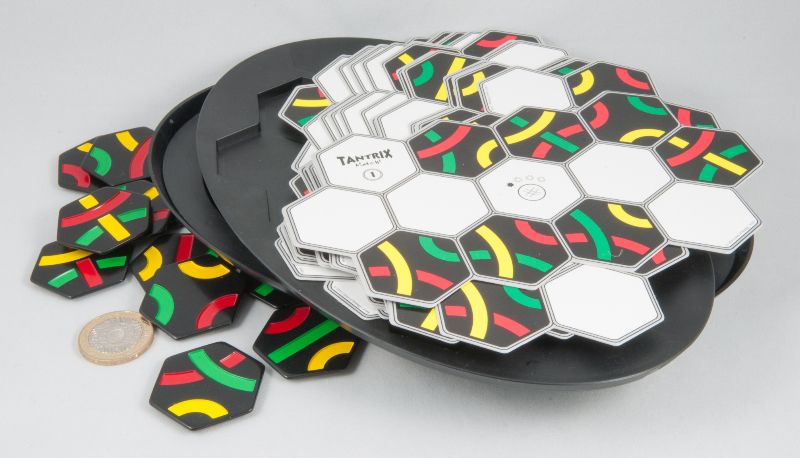 Tantrix Match comes with a moulded playing surface with a space for the problem cards on the top of a tray and storage space inside for the problem cards you’re not currently using (and the tiles when you pack the whole she-bang away). 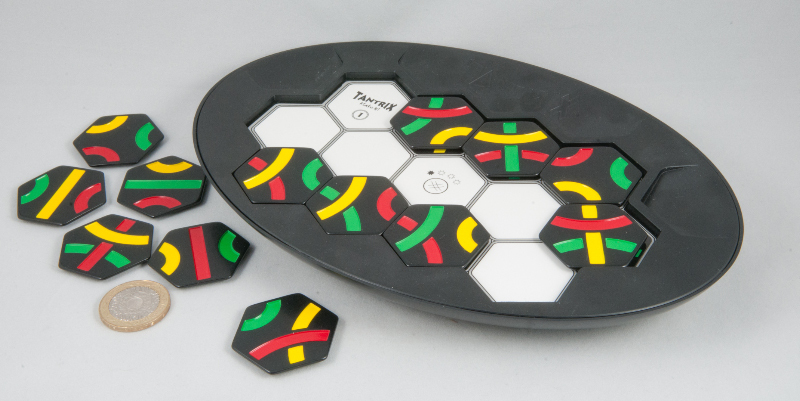 This version comes with 12 graded puzzles each covering a playing area of 13 tiles ... and there are three different types of challenge this time: All of the variants must have all the edges matching, however there are two additional variants that require either a continuous loop or a continuous line to be formed – and your first task is generally trying to work out what colour that line or loop needs to be. Working my way through the challenges didn’t take an awful long time until I got to the very last challenge – just a simple edge-matching challenge as it turns out, except there are a lot of degrees of freedom in there... try and try again, I kept getting to literally the very last piece only to find it wouldn’t fit. After banging my head against that particular brick wall a few times I decided that I needed a more systematic approach to reducing the alternatives and set about creating some notation and drawing tree diagrams and then systematically pruning them back... Sod’s law dictated that I was on my third tree (out of four) before I finally managed to find a solution... Success!